SHOP WITH CONFIDENCE At Mischel's Greenhouses, LTD we value your business and respect your privacy. We strive to keep your personal information secure and private. We do not sell, rent or lend your personal information. Your credit card information is kept secure (even from us!) through our shopping cart software provider. The security and safety of your personal information is one of our top priorities. Your online order information and credit card information is encrypted by our secure servers and is virtually impossible for any third party to access. 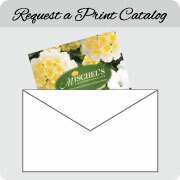 In addition, your Mischel's Greenhouses, LTD account is password-protected. Please do not disclose this information to anyone as you are ultimately responsible for maintaining the secrecy of your account information.